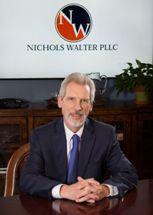 Dean T. Wellman is a partner of Nichols Walter PLLC. He graduated from the University of Kentucky, College of Law in 1980. He began his practice with the law firm of Martin, Ockerman & Brabant and in 1995, he and two partners formed the firm of Piper, Wellman & Bowers. There, Dean handled personal injury and complex civil litigation, concentrating his practice on the defense of hospitals, nurses and physicians in malpractice cases in central and eastern Kentucky. In 2008, he teamed up with Mark Nichols, later joined by Ken Smith, to establish the firm of Wellman, Nichols & Smith, PLLC. Dean holds an AV® Preeminent™ Peer Review Rating from Martindale-Hubbell® and is recognized in Woodward and White's Best Lawyers in America. He was a co-author of the chapter on Hospital Liability in the second, third and fourth editions of Kentucky Health Law, published by the U.K. Office of Continuing Legal Education, and has been a speaker for a number of seminars related to the topic of nursing and hospital liability. Dean is a current member and former president of the Kentucky Academy of Hospital Attorneys. He is also an experienced mediator and is certified by the Mediation Center of Kentucky. Recognized in Woodward/White, "Best Lawyers in America"